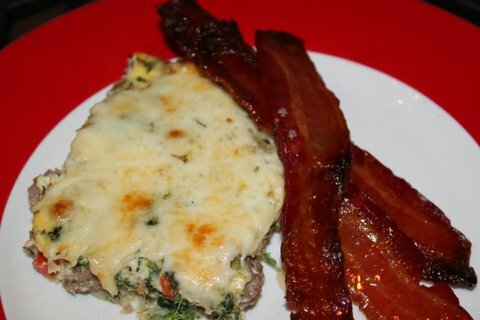 Looking for something delicious and easy to bring to your New Year’s Eve celebration tonight? This twist on a classic shrimp cocktail is the perfect way to ring in 2014! 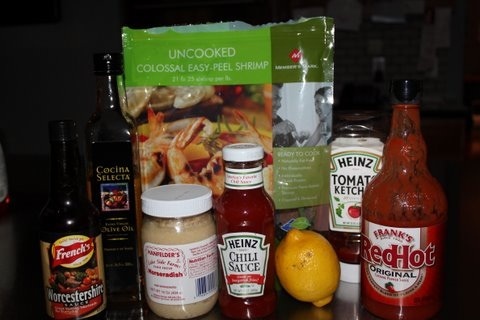 Begin with these simple ingredients. Peel and devein the shrimp, leaving the tails on. Place them on a sheet pan and coat them with the olive oil, salt, and pepper. 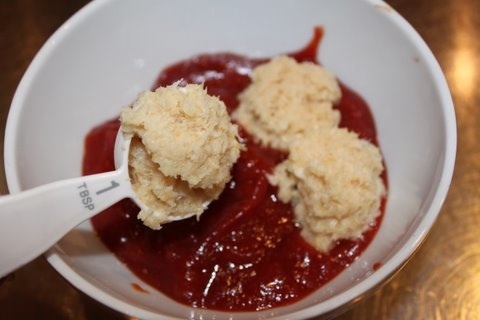 For the sauce, combine the chili sauce, ketchup, horseradish, lemon juice, Worcestershire sauce, and hot sauce. Add horseradish. 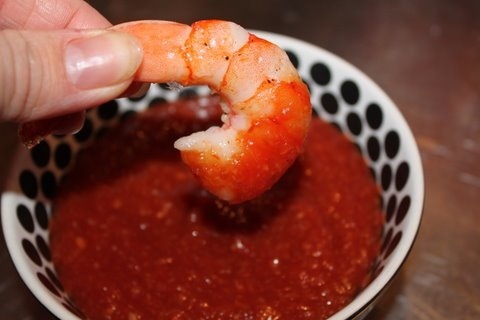 Serve as a dip with the shrimp! 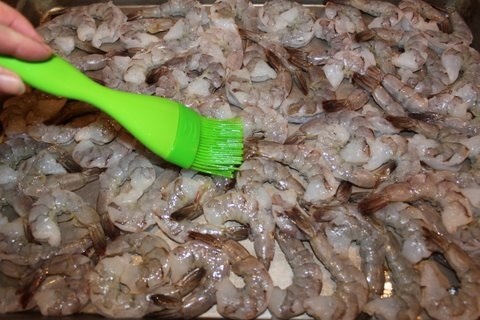 Peel and devein the shrimp, leaving the tails on. 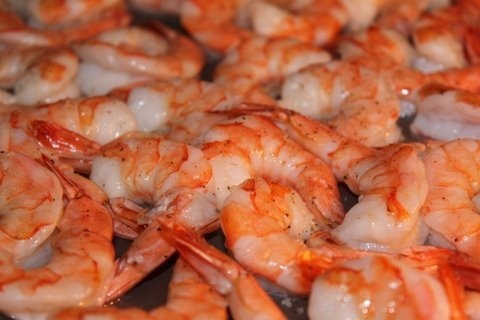 Place them on a sheet pan and coat them with the olive oil, salt, and pepper. Spread them out in one layer on the pan. 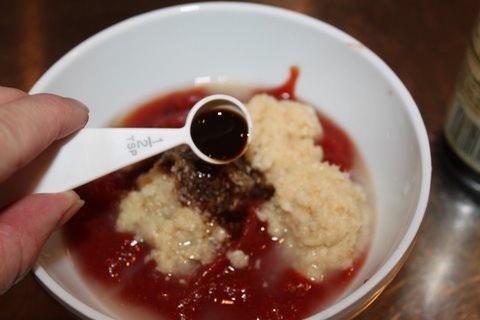 For the sauce, combine the chili sauce, ketchup, horseradish, lemon juice, Worcestershire sauce, and hot sauce. Add horseradish, Worcestershire sauce and lemon juice. Bacon is the best gift you can give your family this holiday season. Especially if it’s bacon with brown sugar. Whether it’s for a holiday party appetizer, Christmas brunch or just because, this bacon is the perfect holiday treat. 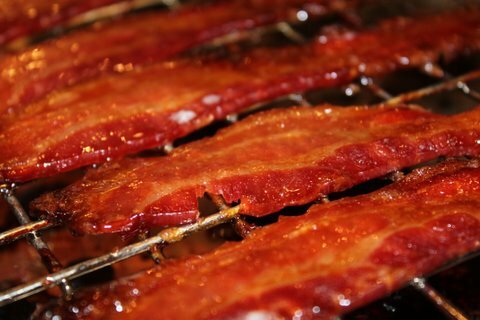 Nothing more beautiful than bacon, right? 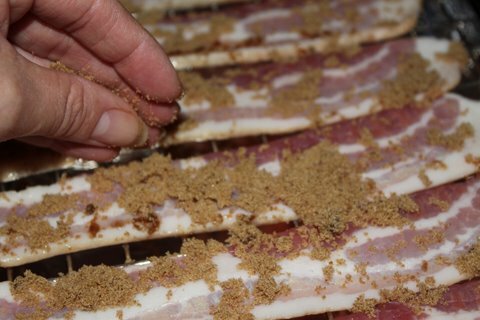 Cover bacon with brown sugar. 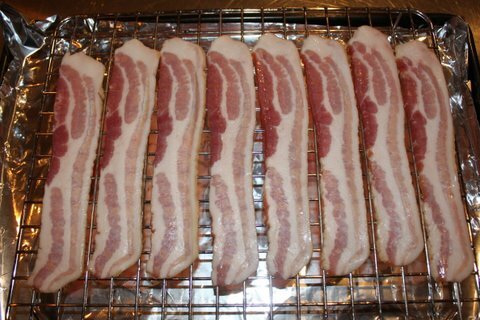 Bake in oven until the bacon is well done but not burned. For us, this took about 15 minutes, but it can vary by oven. This year, forget the jingle-belling and the mistle-toeing – at Blended Kitchen, we’re all about monkeyin’ around on Christmas morning. 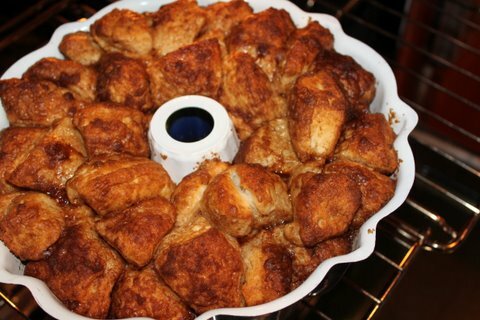 There’s no sweeter way to begin Christmas brunch than with our wildly delicious monkey bread, made with Pillsbury Grands! biscuits, butter and brown sugar. With food this good, the only things your family will care about opening on Christmas morning are their mouths. Start with biscuits. 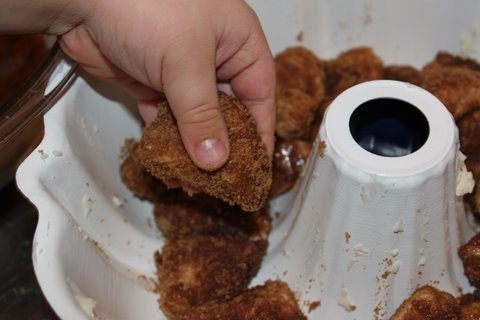 Cut them up into bite-sized pieces. Bake until the top is a deep golden brown and the caramel is bubbling, about 30-35 minutes. Cool the bread in the pan for NO LONGER THAN 5 minutes (to prevent sticking), then turn out onto a serving platter. Then let cool for an additional 10 minutes before eating so you don’t burn your mouth. 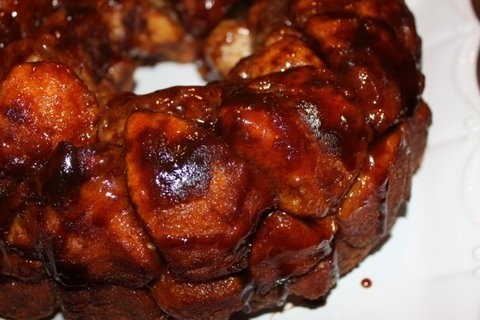 It’s bananas how good this monkey bread is! Bake for 30-35 minutes, until the top is a deep golden brown and the caramel is bubbling. 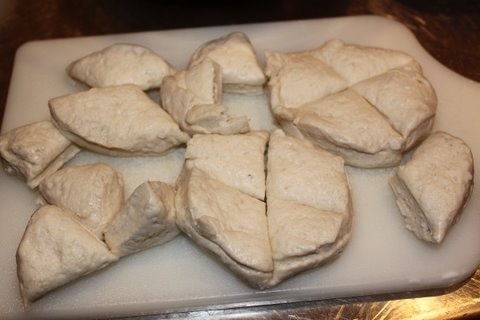 Cool the bread in the pan for NO LONGER THAN 5 minutes (to prevent sticking), then turn out onto a serving platter. Then let cool for an additional 10 minutes before eating so you don’t burn your mouth. This bread is best enjoyed immediately. It’s the most wonderful time of the year! Our schedules are filled with holiday parties, get-togethers and – best of all – cookie exchanges. 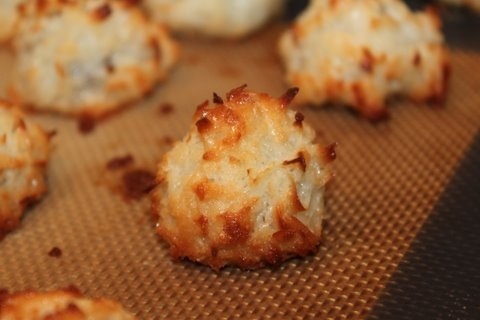 If you’re tired of bringing the same cookies as everyone else, try these almond joy macaroons. They’re a great addition to any holiday cookie exchange… if you don’t eat all of them before you get there! 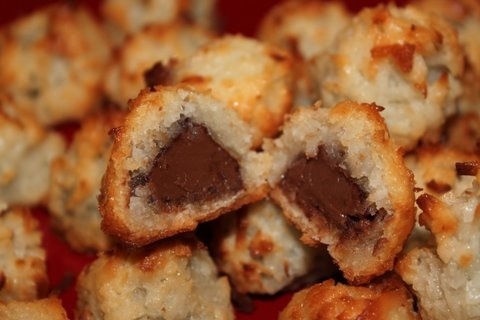 These inside-out Almond Joy macaroons are a Blended Kitchen favorite and an absolute go-to during the holiday season. Lindsey’s stepdad said these cookies are so good that he would eat thousands of them, so be sure to make extras of these – you and your family won’t be able to keep your hands off of them! 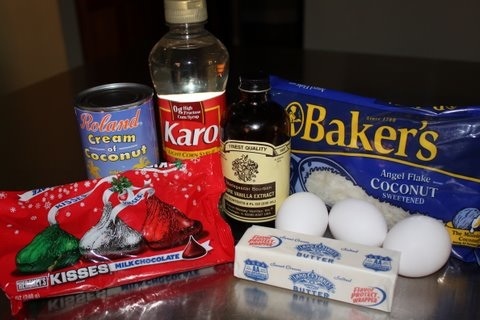 These heavenly cookies begin with a few simple ingredients. 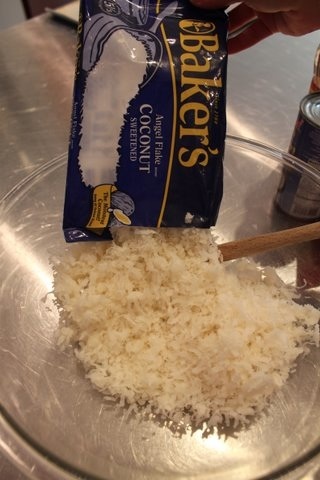 Make sure to get CREAM of coconut, not coconut milk. This is what cream of coconut looks like – not runny and watery like coconut milk. 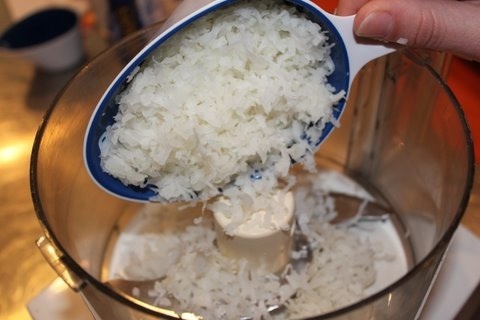 Begin by mincing coconut in the food processor. 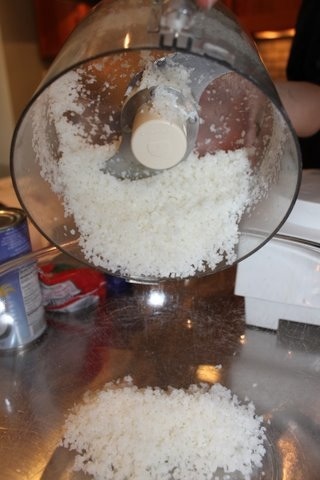 Add the rest of the bag of coconut to the mixture, incorporating it with the minced coconut. 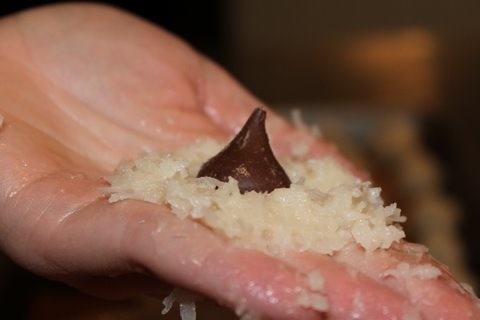 Mix everything but the Hershey’s kisses together and then stick the dough in the fridge to chill for at least an hour (but no more than 24). 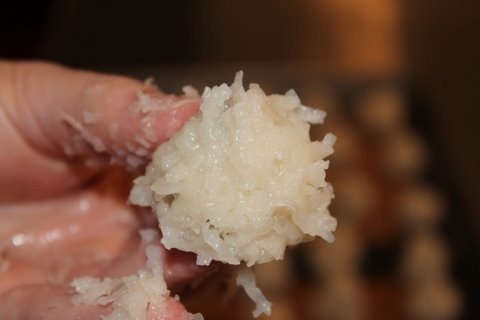 Once dough is chilled, take a heaping tablespoon of coconut dough into your hand and flatten it out. 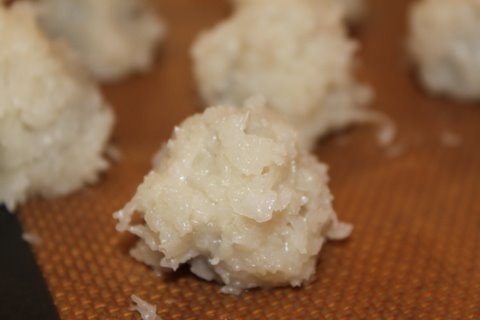 Place a kiss on top of the flattened mixture and wrap the coconut around the kiss, making sure it is enclosed completely. (This takes a little practice). 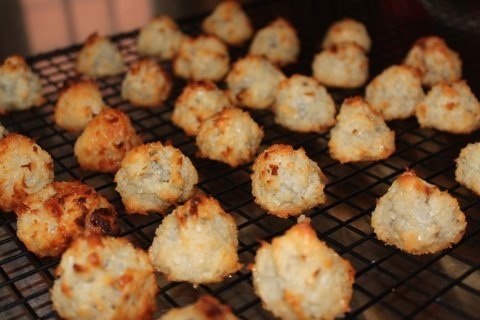 Place each macaroon 1 inch apart on lined baking sheet. Bake until firm and deep golden on the bottom and light golden on the top–about 16-18 minutes. This is cookie exchange gold right here, folks. Add remaining ingredients, EXCEPT kisses. Mix gently with your hands (or with a spatula, if you don’t want to take your rings off!) until combined. 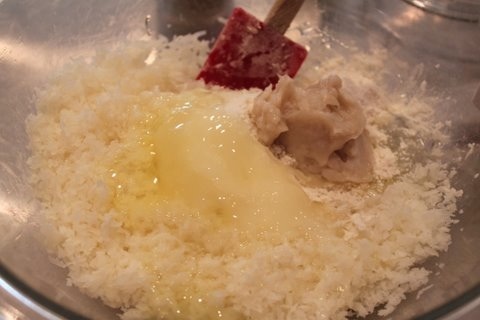 Once dough is chilled, place a heaping tablespoon of coconut dough into your hand and flatten it out. 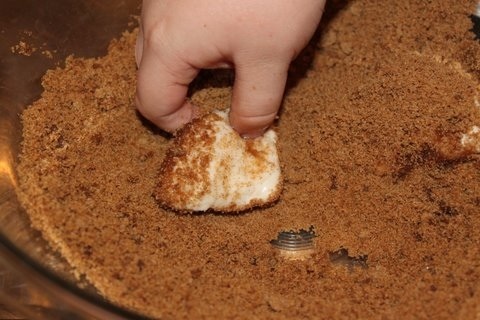 Place a kiss on top of the flattened mixture and wrap the coconut around the kiss, making sure it is enclosed completely. (This takes a little practice). Place 1 inch apart on lined baking sheet and bake until firm and deep golden on the bottom and light golden on the top–about 16-18 minutes. Baby, it’s cold outside! We need something to warm us up on this chilly day. 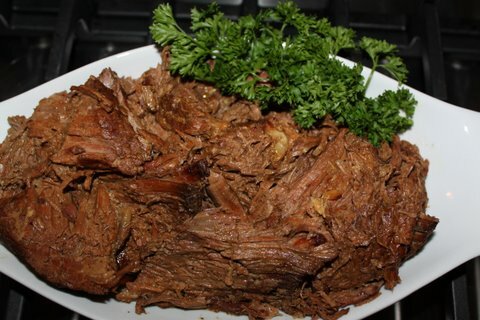 This easy slow cooker roast beef reminds Cindy of a roast her grandma or mom would make on weekends for a special dinner. It’s just a really good old-fashioned roast beef, with great flavor and delicious au jus. At mom’s house, this roast would be served with buttery mashed potatoes and some green beans. But this is also delicious with a simple salad or some fruit. This dish is diet lifestyle-change-friendly, with the only added fat coming from one or two tablespoons of olive oil. 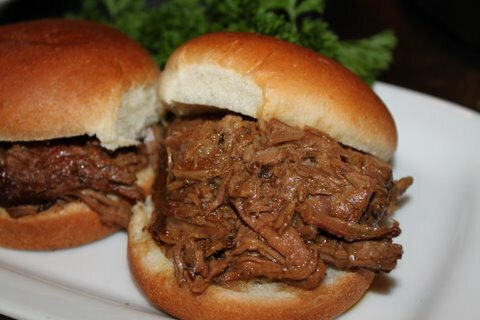 The beef is also kid-friendly, especially when you put it on a bun with a little slice of cheese. Take Note: the roast will shrink while cooking. A four-pound roast makes enough for our family of five and it gives us leftovers. If you’re cooking for fewer people, buy a smaller roast but use the same amount of olive oil and spices. It all starts with garlic. A lot of garlic. Slice holes in the roast and stuff the garlic cloves into the holes. If you couldn’t tell, we like a lot of garlic. The amount that you actually use is up to you. But, if you’re asking our advice, we say load it up! Rub a mixture of paprika, chili powder (leave this out if the kids don’t like it), seasoning salt, garlic powder, mustard powder and garlic salt into the roast. 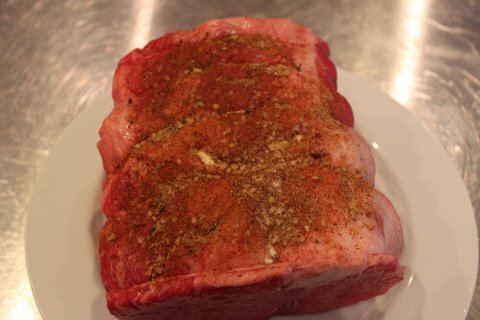 After massaging the spice rub into the roast, brown it on all sides using one tablespoon of olive oil. 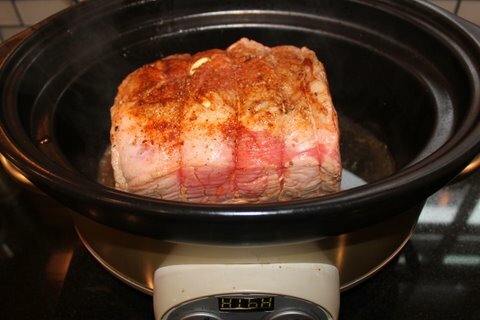 Transfer the roast into the crock pot, cooking it on high for 8 hours with a 1/2 – 1 cup cup of beef broth. 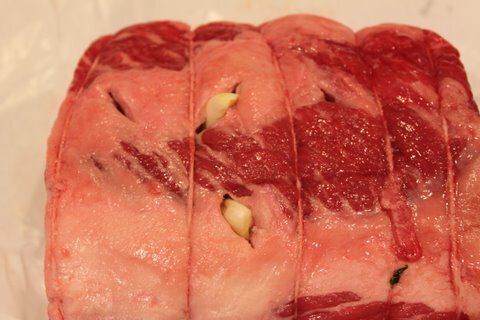 If your roast is big and thick, you can cut it in half so that it will cook faster. For us grown-ups, we serve the beef without a bun. 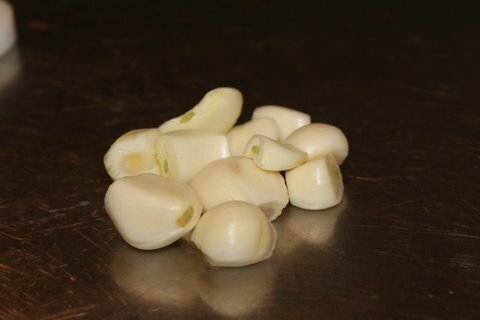 This makes it easier to find all of the roasted garlic cloves – those are Lindsey’s favorite parts! 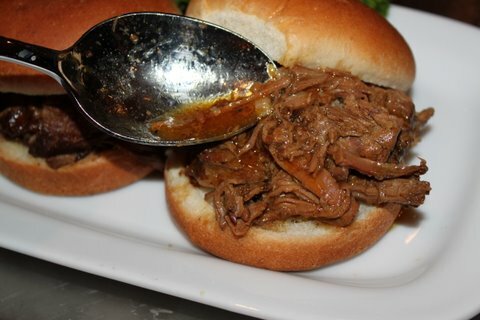 For the kids, we serve the roast beef on buns, with a little drizzle of the roasting juices. Top this sammy with pepper jack cheese! Slice holes into the roast and insert garlic. Mix all dry ingredients in a bowl and massage it into the roast. 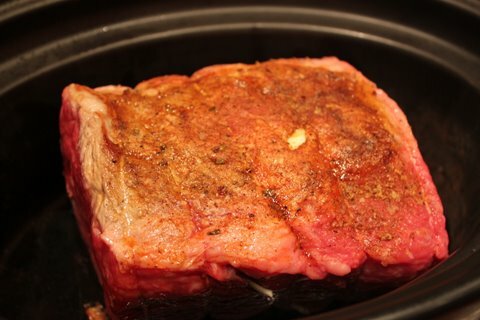 Brown the roast in one tablespoon of olive oil on all sides. After browning the roast, transfer it to the slow cooker, add the broth and cook on high for at least 8 hours. If your roast is large, cut it in half to cook faster.